I don’t know about you, but I’ve always been a fan of St. Patrick’s day! When I was a kid, we would go to my grandma’s house every year for the full Irish meal, and it was always so fun. My grandma was a stickler when it came to wearing green, and my mom always tried to get by on her green eyes, or somehow thought that being part Irish got her out of the wearing green requirement (it doesn’t, FYI). 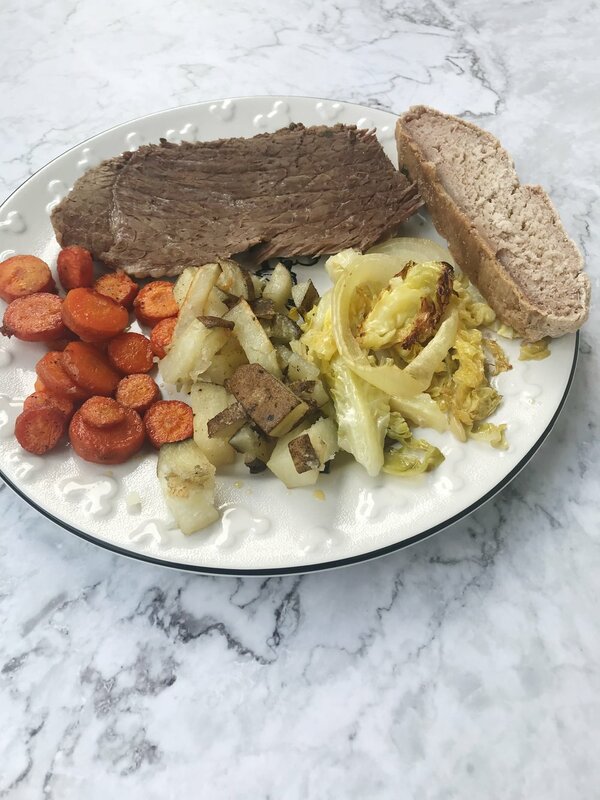 After visiting Dublin, Ireland last month, touring Guinness, and eating a BOMB corned beef sandwich while I was there, I got super pumped to put together my St. Patty’s day meal this year. Also, while we were on the bus tour, we saw St. Patrick’s Cathedral and I was reminded again about how much I love the story of St. Patrick, so I’m extra into it this year! Now, I love to make some corned beef and cabbage every year, and honestly usually stock up with a few after they go on sale after the 17th. I’m going to share with you, what I put together this year, and my favorite brand for corned beef. The main event: Corned beef! I shopped at Whole Foods and bought Wellshire Farms corned beef round. I love Wellshire Farms, and you may notice if you follow along in my instagram stories that they make my most favorite Paleo bacon! This year, I cooked this in the instant pot. I kept it super simple, I had about a 4 lb round, added water almost to the top of the meat and cooked for 85 minutes, and it turned out great! Veggies: Now, It’s no secret that I’m a big fan of simplicity in cooking and that I love my oven roasted veggies almost as much as life itself, so naturally I decided to do it all that way this year! I drizzled a couple of pans with avocado oil, added chopped potato and carrots on one, and chopped cabbage and sliced onion on another, I added salt/pepper/onion powder and some more avocado oil, and roasted at 350 until they looked delicious, maybe about 30 minutes. Soda Bread: Of course, no St. Patrick’s Day meal would be complete without soda bread! I created my own Paleo version and it was delicious, if I do say so myself. If you’re interested in the recipe, you can get that here! I hope you have a great St. Patrick’s day meal this year with family & friends, no matter what exactly you eat!